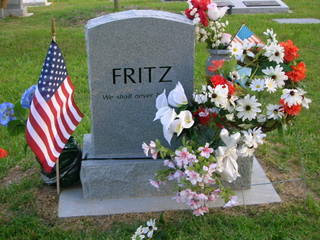 Chapel Hill, NC, February 4, 2007 — Carl R. Fritz passed quietly during the early morning hours today. He was a member of both the American Legion, Post 6 Chapel Hill, and our VFW Post. He was a veteran of the United States Army and served during World War II in Indo-China. Born in Tifflin, Ohio, home of Tifflin University ad Heidelberg College. He attended Tifflin University briefly but had to leave college for financial reasons. He went on to join the Baldwin Locomotive Works near Philadelphia. Carl was drafted in 1943. He was drafted in 1943 and went to basic training in nearby Atlantic City, New Jersey. Following completion of basic training, Carl was sent to the Central Radio School in Kansas City, where he was promoted to Corporal and graduated as a high speed radio operator skilled in Morris Code. Carl volunteered for aviation duty and was off to aviation school and a series of schools at the Michigan College of Mines and Technology. From there he was off to Ellington Field and on to advanced navigation school at San Marcos, Texas. He was later assigned to the Headquarters and Headquarters Squadron of the 382nd Air Service Group. The 382nd boarded a troopship to Bombay, India. From Bombay they went by training across India and then by ship to the port of Chittagong which is now in Bangladesh and which was then part of British India. Carl’s unit stayed in Chittagong until 1945 monitoring radio broadcasts about battles with the Japanese going on in s0uthern China. His outfit was then off to an area in northeast India called Chabaua. From there they were put on a plan and flown over the hump into southern china for duty. Carl worked at the radio station and was later assigned as the radio operator on a plan from the base which carried supplies to the troops scattered in southern China. In December 1945 his outfit was sent to Shanghai to board a troopship for Seattle, ending his wartime overseas. Carl returned to Far East later as a member of the organization that became he Agency for International Development. He had a long and distinguished career with AID. During one of his assignments to Bangkok, Thailand, he met and married hi “neater, sweeter maiden” Tarinee. They have been lifelong partners ever since. Carl is survived by his lovely wife, Tarinee. The Post wishes to express our appreciation to Comrade Jim Stallings, the historian who gathered this information and originally published it in our Post May-June 2006 Newsletter.